We Drink Your Milkshake! 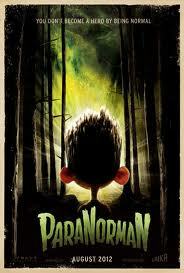 : PARANORMAN Trailer Is Probably The Best Trailer Of The Day. So yes, to say I'm looking forward to this is the definition of an understatement. The premise is fun, the voice acting feels pretty up to part with the big animation movies, and what I liked the most was the style of physical humor in the movie. I'm very interested to see how well the 3-D will be in comparison to CORALINE and how much CG is actually being used. In ParaNorman, a small town comes under siege by zombies. Who can it call? Only misunderstood local boy Norman (voiced by Kodi Smit-McPhee), who is able to speak with the dead.